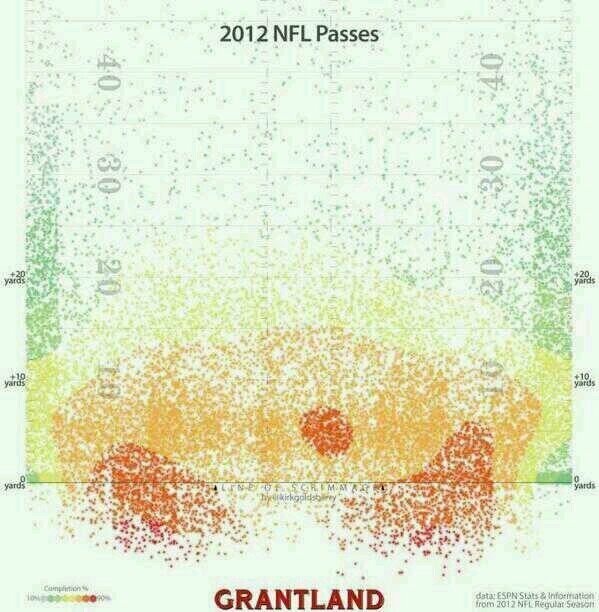 This graph shows the completion percentage for all throws in the NFL in 2012. When you look at the completion percentages, an interesting thing happens: the flat is a very high percentage throw until you get to the numbers. Once you get to the numbers the completion percentage drops dramatically as you move toward the sideline. The most intuitive thing that you will notice on this graph is how completion percentages drop as you get further down the field. If you watch your own offense in patterns on air, you will see that even without coverage completion percentages drop as you throw the ball down the field. How does this translate to coordinating a defense? Many guys feel very safe running cover 3. But when you look at this graph you see that the windows cover three leaves are all high percentage throws. The reason that pattern matching has become more popular in defensive pass coverage is that it can push the ball outside the numbers and down the field. No coverage is perfect, and all have their weaknesses, however in passing situations it would be best to push the ball out to the areas of the lowest completion percentage. If you are interested in learning about a particular coverage that allows for pressure and pattern match to add to your repertoire try coach Albers' book on the pattern read 4-3 defense. Teaching tackling is certainly a mix of art and science, but one thing I have learned is that we have to put tools in the hands of our players that will help them be successful in different situations. I believe that "Roll Tackle" is one thing we all need to teach our players. Roll tackling is a way to tackle the legs of a ball carrier under 2 specific circumstances: (1) the over sized, physical back bearing down on the tackler, and (2) making a play in pursuit as the ball carrier is running away from your player. The roll tackle is a great way to combat a physical back who will either lower the shoulder and attempt to run over tacklers, or use the stiff arm to keep tacklers from getting to him. The physical stiff arm is difficult to combat in any other way. I have heard coaches talk about swating the stiff arm down and them tackling, but I have yet to be able to teach that to a player and see it in action on game film. The best way to combat this issue is to roll tackle, so that the stiff arm cannot reach the tackler in the first place. It is also effective in attempting to run down the ball carrier in pursuit. The pursuit that we all spend so much time on is only good if it results in a tackle- so why not give kids a tool to use when they are running someone down in pursuit? Note that the roll tackle is not simply "diving at legs" or "cutting' the ball carrier, but a method to shoot hands, wrap up, and finish the tackle, just as we would expect every tackler on the defense to do. We call it the roll tackle becasue of the action of the tackler's body when he executes this tackle. Players should punch their hands, just like on any other tackle, once the hands are around the ball carrier's legs, they should be squeezed to the chest, tucking the shoulder in. This creates a scenario by which the tackler rolls and bulldogs the ball carrier, increasing the likelihood that he will go to the ground. I'll be presenting my clinic on Run support Thursday night, from 6-8 PM Central time on the Glazier webinar series. This is a companion clinic to the Pattern Read Coverage clinic I did for the Webinar Series back in January, but don't worry, if you didn't see that one, you will still get plenty out of this one. It is not a pre- requisit by any means. There is no charge for this clnic for Glazier Season pass holders, so register today. I'm looking forward to another great webinar Thursday night! What's the connection here? Well with the Tebow trade rumors swirling, I was thinking of the teams who struggled containing the running QB, and those that performed well against him. It didn't take long to figure out that the most athletic defensive ends give the read option its most difficulties. I was thinking of multiple reps where Julius Peppers gave Tebow a pull read, and then was athletic enough to stay in front of him after he did pull to run. This is the pioint where coaches say, "I don't have a Julius Peppers on my team." Well neither do we, but it is, in fact, a relative comparison. The concept here is to be comparatively athletic. As I read more about Jimmy Johnson's philosophy at the U of moving safeties down to LB, LB's down to end, I understand the value more an more, especially in light of the gravitation toward athletic or dual threat QB's. One cornerstone of our success has been that we have made the conscious decision to get faster on defense. This includes taking a "step slow" safety and moving him to Wil; a step slow LB and moving him to end, etc. What that does in today's read option world is give you an equalizer- the end doesn't have to be fast enough to run with the athlete playing QB, just fast enough to confound the read and stay in front of him long enough for help to arrive in pursuit.